Speaking of one of his former minor leaguers to The Inland Valley Daily Bulletin in 2008, P.J. Carey recalled the player's work ethic. The player he recalled was Juan Pierre, who in 1999 worked as a Rockies minor leaguer at single-A Asheville as Carey served on the Colorado player development staff, The Daily Bulletin wrote. "He brought to the game the most professional work ethic I have seen with any player during my time in baseball," Carey told The Daily Bulletin of Pierre. Carey's time in the game spanned four decades. After four seasons as a player in the minors in the 1970s, Carey went on to serve as a manager in the minors for 25 years before turning player development adviser with the Dodgers. Carey's long career in the game began in 1972, signed by the Phillies as an undrafted free agent out of the University of Scranton. Carey started in the minors at rookie Pulaski. He moved to short-season Auburn and single-A Spartanburg for 1973. He then continued at single-A through the end of his playing career in 1975. By 1980, he was managing in the minors. He served that year with the Phillies at short-season Central Oregon. He arrived as manager at short-season Bellingham in 1988 and continued through 1990. His 1990 card back included high praise. "P.J. is an outstanding coach and instructor," the card back reads, "and has extraordinary patience with the young players." He managed single-A Charleston in 1991 with the Reds. In 1993, he moved to the Rockies system. He served there for more than a decade. In 1996, Carey served as manager at single-A Asheville and talked up an early season series after a hard-fought game. "Whether they say it or not, the kids on both sides know this is a big series," Carey told The Greensboro News and Record. "The kids read the newspapers. It's very, very early in the season but what we're trying to do is be competitive every single night out." Carey served much of his time with the Rockies in rookie ball. 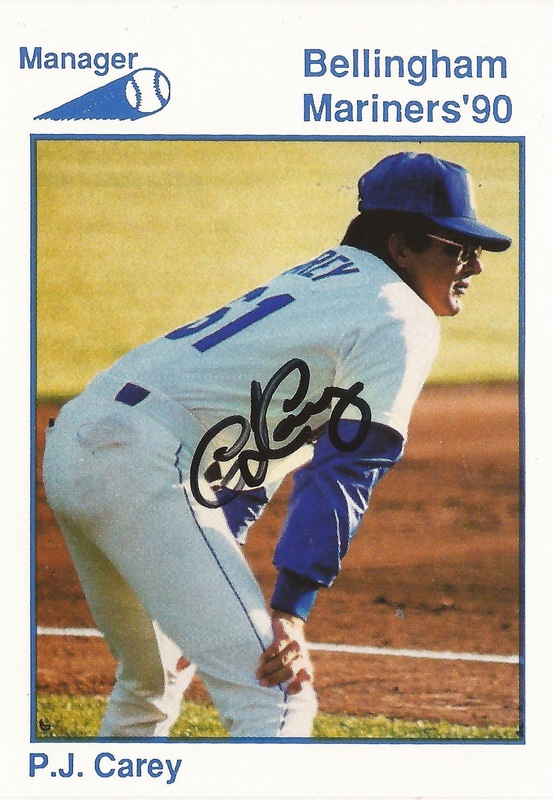 He managed in the Arizona League and five seasons at rookie Casper. He spent one season helming AA Carolina in 2002. In 1997, he served as bullpen coach in Denver. He left the Rockies for the Dodgers in 2007 to become his new club's field coordinator. Soon diagnosed with cancer, Carey passed away in 2012 at the age of 59. "Our entire organization grieves at the death of P.J. Carey," the Rockies said in a statement after Carey's passing. "We were deeply saddened to learn of P.J. 's passing on Friday evening. He was a great husband, son, brother and friend to so many throughout our organization and the baseball community. Our thoughts and prayers go out to his wife Katherine, family, and to all of those whose lives were touched by P.J. over his life and 40-year career in professional baseball."